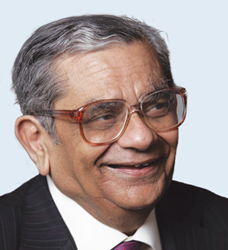 Jagdish Bhagwati, renowned professor, member of UN Secretary General Kofi Annan's High-level Advisory Group and the External Advisor to the Director General World Trade Organisation (WTO), is regarded as one of the foremost international trade economists of his generation. He was born in Mumbai, India in the year1934. He did his B.com from Mumbai in 1954 and post graduated in l956 from Cambridge University with a first in Economics Tripos. He then did his Ph.D at MIT (Massachusetts Institute of Technology) in 1967. After studying in England and the United States, Bhagwati returned to India in 1961 and served as Professor of Economics at the Indian Statistical Institute, and then as Professor of International Trade at the Delhi School of Economics. He returned to MIT in 1968, leaving it twelve years later to join Columbia, as the Ford International Professor of Economics. Bhagwati is one of the only 10 scholars who hold the title of University Professor at Columbia. Professor Bhagwati has made major contributions to pure theory and is engaged with major practical policy problems as Economic Adviser to the Director-General of GATT(1991-1993) and Special Adviser to the United Nations on Globalisation. He is a Fellow of the Econometric Society and has been elected a member of the American Philosophical Society, and the American Academy of Arts and Sciences. He also writes regularly for The New York Times, The Wall Street Journal and The Financial Times. He has written or edited 40 books, written hundreds of articles, and founded and edited two journals, 'Economics and Politics' (1989) and 'The Journal of International Economics' (1971), the premier journal in the field today. Among his famous books are 'In Defense of Globalization' (2004);'Free Trade Today' (2002);'The Wind of the Hundred Days' (2000);'A Stream of Windows' (1998);'India in Transition' (1993);'World Trading System at Risk' (1991);'Protectionism' (1988); 'Economics & Politics' (founder-editor); 'The Journal of International Economics' (founder-editor) etc. He has been honored with Honorary D.Litt degrees from several universities they are, Erasmus (Netherlands) and Sussex (UK), South Gujarat University. Among the awards he has received are the Mahalanobis Memorial Medal ( India ), the Bernhard Harms Prize (Germany), the Kenan Prize (USA), the John R. Commons Award (USA), the Freedom Prize (Switzerland), and the Frank E. Seidman Distinguished Award in Political Economy (USA). Professor Bhagwati has delivered many prestigious lectures, among them are the Frank Graham Lecture at Princeton , the Bertil Ohlin Lectures at the Stockholm School of Economics, the Harry Johnson Lecture in London, the Eyskens Lectures in Belgium, the Radhakrishnan Lectures in Oxford, and the Prebisch Lecture at UNCTAD IX in Johannesburg. Bhagwati is currently Director of the Program on International Migration: Economics, Ethics and Law at the Columbia University Law School. He presents himself as the human face of global laissez-faire economics. On the personal front Bhagwati, is now living in America, with his wife Padma Desai, who is the Gladys and Ronald Harriman Professor Of Comparative Economic Systems at Columbia University and a scholar of Russian and other former socialist countries' transition problems. 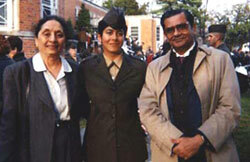 They have one daughter, Anuradha Kristina Bhagwati, a U.S. Marine officer. At 70, he is widely tipped as a future Nobel laureate, so respected among his fellow economists for his insights into the workings of foreign trade.